Do you ever feel like your child’s toy collection is taking over your home? I remember the days of the kids’ big toy box being emptied onto the floor, and then the disappearing act when it was time to clean them up. I thought the problem was that we weren’t strict enough, but now it seems like we just may not have made it enough fun! These 5 Toy Storage ideas will make cleaning up the clutter in your home a fun game that the whole family will enjoy. Or, if your kids are really into arts and crafts, storage ideas for those can be found here! If your children have been accumulating bath toys, you should get the Hurley Hippo Bath Toy Organizer to store them all out of the way. You will be very pleased with this Toy Storage idea. The best and most important thing to me is that this bath organizer does not get moldy. I love that it is mesh, so that when the toys are put in wet, the water just drips out and right down into the tub. Also, I was really impressed by the strength of the suction cups. Good instructions too, glad I took the time to read them as the suction cups are special. They increase suction as you twist them so just be sure to read the instructions before mounting it on the wall. If you follow the instructions, the suction cups will stay on the tub walls and won’t slide down, even when it is full of bath toys! And full it will be: The pocket is pretty large and will gather quite a few tub toys. Also, the basket isn’t permanently attached to the suction cups so you can unhook the basket and dump all the toys in the bath tub with ease. Not only is this organizer super cute but it is well constructed, holds a lot, and more importantly does not budge off the wall. Kudos to the designers of this. It may be worth noting that prior to attaching this to my ceramic shower wall, I cleaned the tile area for suction cups with a bit of rubbing alcohol. I would recommend this to anyone looking for a bathtub toy organizer, it is absolutely adorable, and functional as well! 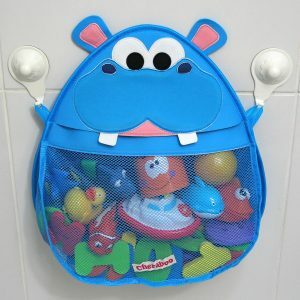 Check out the Hurley Hippo Bath Toy Organizer here. The Disney Frozen Collapsible Storage Trunk makes a perfect addition to your child’s bedroom, closet, or playroom. The size of this product is perfect, larger than expected, but that was a plus! And it’s sturdy, given that it’s also collapsible. Not super flimsy. The storage trunk is an easy way to maintain clutter and is great for soft toys or toys that stack up nice and neat. I also love the fact that the lid Velcros shut. It’s made of a soft canvas material, so you never have to worry about the lid slamming down on your children’s fingers. It’s a great size, great quality, and the colors and design are vibrant and flawless. It has handles which makes carrying it as easy as can be. Just make sure you don’t carry it around overloaded. Your little ones will enjoy playing and putting away all their toys, books, clothing and more in this spacious storage trunk. When not in use, it can fold down flat and be tucked away. This trunk will be the perfect gift for the youngest ones, and you can even use it as a very creative gift-bag. This one of those Toy Storage Ideas that will make your children double-happy since they will be able to play with the gift box and use it to collect their toys later on. 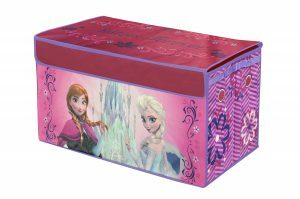 Check out the Disney Frozen Collapsible Storage Trunk here. This LANGRIA 9-Cube DIY Modular Shelving Storage is exactly what you children’s room needs. This is a perfect Toy Storage Idea for kids rooms with a smaller surface. Combine the panels depending on your needs and thanks to its light color, it will create an optical effect that will make a small room seem bigger than it actually is! It will also add a modern, simple design that can easily match any style no matter where you place it. It’s a sturdy shelving unit with an infinite amount of ways that it can be put together. It’s strong enough that you can leave out a couple of panels and it will still stay together. Build the cubes together to form an entire closet, or separate them into a couple of matching shelving units. Assembling it should take less than 20 mins! Very simple and easy. There is also a manual which comes along with it on how to assemble the cubes! Once assembled you’ll notice there are small gaps in each shelve on each end. Even this is a bonus since the gaps will provide proper air circulation so that there’s no chance for molds. You could also utilize these gaps for connecting a children’s lamp or any electric devices to the wall socket. This makes it more simpler and looks neat as all the wiring is done through the gaps. Cleaning is super easy, just wipe it with a damp cloth and it’s clean. Great product that is light weight and easy to move, and yet sturdy enough to have good functionality. 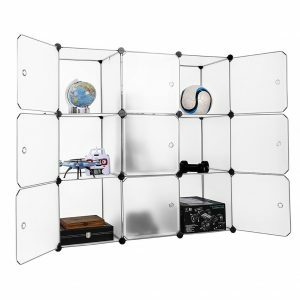 Check out the LANGRIA 9-Cube DIY Modular Shelving Storage here. 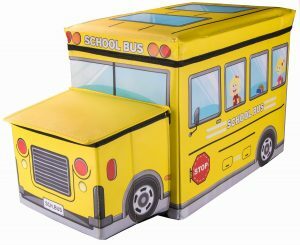 The School Bus Collapsible Toy Storage Box and Closet Organizer is a great alternative to the every day toy box and it looks super cute while holding a surprising amount of books and small toys. It has quite a bit of space and will hold many Barbies, Trucks or smaller toys. If you use it to store larger toys like standard size teddy bears, it will hold a few of them. The bus is very roomy inside. Your children can even play with the bus by itself with nothing in it. It’s fairly sturdy but it can bow from overstuffing so make sure not to overstuff. It is super easy to put together and the vinyl-like exterior will make it easy to keep clean. This makes a great and fun toy storage container for children, but it makes and even cuter one for a classroom. If you use it in a classroom, it’s a great way to store classroom supplies or even classroom toys. I can see this being a great Gift for young children because of the sturdiness. Check out the School Bus Collapsible Toy Storage Box and Closet Organizer here. 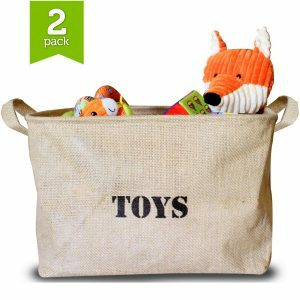 Ziggy Baby 2 Pack of Stylish, Reversible Jute Toy Bin Organizers are the perfect storage containers for toys in the nursery, playroom, bathroom or bedroom. They are made of Jute material which is a long, soft, shiny vegetable fiber that can be spun into coarse, strong threads, meaning the bins are organic and eco-friendly. They come packaged flat so the only thing you need to do is pop them open and you are good to go. Unlike other pop up type baskets, these stay open and do not collapse, even if they are empty. You will love these storage organizing bins! They are cute and functional. They fold flat when you need to store them away and they stay upright when you need to store toys or knick knacks. The look of these definitely hit the country theme perfect. They are a nice natural color with a plastic lining so it’s more durable and can also catch spills if it gets wet. My favorite feature is that both totes are two sided. One side says toys and the other side says storage. Good for organizing kids toys among other things. I like the handles, makes them easy to pick up and carry while picking up toys. 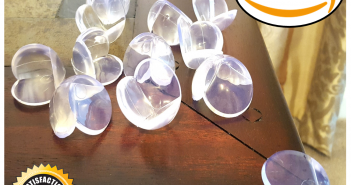 I would recommend these to anyone that wants to reduce the clutter in their house but also get something that matches their décor. Feel free to use these beautiful storage baskets inside or outside of the house as a Pool Toy Storage as they are lined and waterproof on the inside. They are very well made and will definitely last quite a while. Check out the Ziggy Baby 2 Pack of Stylish, Reversible Jute Toy Bin Organizers here. 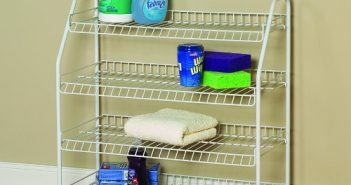 If you have a toddler or young kids that always leave toys out, these Storage Organizers are a must for you. Choose the one that suits your needs and style. These 5 Toy Storage Ideas are great for anyone who needs a little extra organization in their house. If you liked this post, you should check out our longer list of around-the-home storage ideas!